Many people don’t tend to think of radiators as an interior design statement, however, with all the latest technology improvements and state-of-the-art radiator designs available these days; they can indeed be just that. Of course, there is no point buying these incredibly stylish and fashionable radiators if they don’t actually do the job of heating your home well; fortunately, these new age radiators are extremely adept at heating up homes and doing so exceedingly efficiently too. How do modern designer radiators save you money? Less water is needed to heat them up, which means that you will feel the heating effect a lot faster than usual and you won’t need to crank the thermostat up as high, so your heating bills will be greatly reduced each year. Designer radiators are often made from materials, such as aluminium, that conduct heat a lot better than the older, more traditional, iron clad radiators. This means that they heat up a lot faster and then retain the heat for a lot longer, which means you don’t have to have your heating on for as long. Modern stylish radiators come with their own individual thermostats, which gives you a lot of control over the temperature in each room and means that you can reduce the temperature in rooms that you don’t use as often, which will reduce your heating bill. Designer radiators are built to last and you’ll find that they do not reduce in efficiency as quickly as the more traditional iron clad ones do. This means you don’t have to be as concerned with maintaining or replacing them as often, which obviously saves you money. How do designer radiators contribute to my interior design? Radiator technology has vastly improved over the last 10 years or so and this has meant not only that people can now be more environmentally friendly when it comes to heating their homes but also that they can do so with radiators that look stylish and fit in with the interior design, rather than settling for the ugly white rectangles that we are all so familiar with. 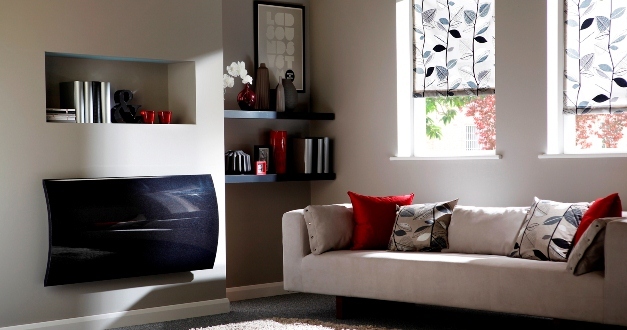 Installing modern radiators in your home can truly improve the aspect of each room they are in. It is now possible to find radiators in a wide variety of different colors, so you can install the right ones into rooms of matching color. You can also choose radiators of peculiar or unusual sizing, in order to install them in previously unused, wasted corners of your home. You can also find a large choice of designer radiators that look more like sculptures and even paintings, should you wish for the heating components to be disguised. There is such a magnificent variety of these designer radiators that everyone, no matter their taste in interior design, will be able to find something that suits them. So, not only can you improve the appearance of each room in your house by installing beautiful, modern decorative radiators but you also get to save yourself a lot of money through the increased efficiency of these radiators, which makes making the decision to upgrade to them a very reasonable and easy one. Laura Harrison writes for designer radiators retailer Jaga Home Heating about home interior design and heating energy efficiency issues. She's passionate about green solutions to everyday problems and when she isn't blogging she's found at her local gym or in the park with her dog, Indy.